01 Aug We have lift off. The wheat market is firing on all cylinders. We are going to the moon. The pedal is to the floor. We are cooking with gas. These are a few appropriate analogies for the market movement this week. In this article we look at the price movements in Australia and seven other markets around the world. The ASX east coast wheat coast contract has been on a steady climb over recent weeks however this week the market has been on fire. The price has increased a whopping $27 since last Friday (fig1). This is because of continued dry conditions on the east coast in conjunction with the flow on effect from the wider worlds woes. It is a catch-22 for many, as although prices are high many are not able to take advantage due to lack of production especially in northern NSW/QLD. The high price is very unlikely to mitigate for the loss in yield. The producers in Victoria and parts of South Australia with reasonably good crops will all going well be able to take advantage of the benefit of inflated pricing. As alluded to earlier, conditions in other parts of the world are on a downward trend. In last weeks update I mentioned that northern Europe is in dire straits. The last few days of harvesting are pointing to this resulting in Europe’s export capacity declining. 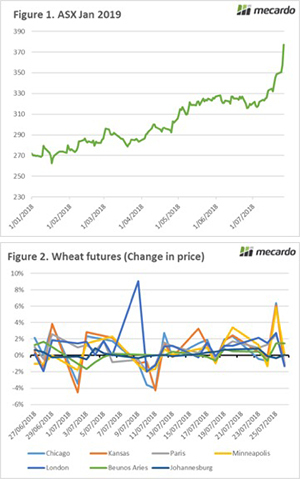 This has resulted in futures around the world rising, with the majority of wheat exporters now seeing year on year declines in exportable surplus. In the last fortnight the different wheat futures around the world have seen solid gains (fig 2), with only between 3-4 days of negative results (dependent upon bourse). It is going to be an interesting month as we gain more resolution on the northern hemisphere crop. In Australia the lack of rainfall is likely to result in continued strong pricing well into the 2019/20 season on the east coast. The commitment of traders report will likely see an increase in the long (bought) position in wheat by speculators. At some point they will likely want to take their profits leading to some price correction. Nonetheless the fundamentals are supporting these strong levels, especially in Australia.